You are here: Home > Frequently Asked Questions about Bamboo Boards, Plywood Panels & Bamboo Flooring > Why choose Eco-Logic Bamboo over other Bamboo products? Why choose Eco-Logic Bamboo over other Bamboo products? Bamboo timber board quality – is there really a big difference? As the saying goes; “talk is cheap”. Anybody can shout from the roof tops that their products are “the very best bamboo available” and that they are “leaders in quality”. How does one know if their bold claims are true? Ask them to prove it! Do their boards have a vertically cross laminated core structure? If not, the boards will not be as stable. Expect to spend extra time and money on material to get your job right. Are the glues they use to manufacture their boards non-toxic? Low and non-toxic glues are also typically higher quality glues that cost more. Skimping on glue costs equals higher profits for the manufacturer. If the supplier claims low toxicity (Formaldehyde), ask them to prove it with an independent international certification – in their own brand name (not simply claiming the credentials of a supplier). The bonding strength of the glue is critical. How does one test for cheaper glues? Pop a sample in a dishwasher hot wash cycle. If the sample falls apart, cheaper glues were used. Want us to prove our quality? Sure, let us know and we will. We are all familiar with the cliche; “Jack of all trades, master of none”. Manufacturing top quality bamboo boards takes significant skill, tested knowledge, well defined and controlled processes. Each bamboo product is subject to different specifications and processes to achieve the best result. Manufacturing a thick board is very different to manufacturing a thin board, etc. But when you have one factory churning out a full range of products, compromises have to be made to suit the production line efficiencies. This often means “one size fits all”. Unfortunately (for us), we learnt this lesson the hard way. We also fell for the “we are the world’s leading bamboo manufacturer” promises, the big tours and fancy meal tactics and paid the price. We have worked with multiple factories and visited a LOT more over the years (ask the different suppliers how long they have been dealing exclusively in bamboo boards and how many times they have personally visited their factory!). We realised that some factories are really good at specific products and mediocre (or just plain bad) with others. A symptom of the one size fits all approach. One day we visited a factory with the sales lady giving us the big tour of “their” factory. Two days later, another company was showing us “their” factory – the same one we had visited 2 days prior. Many factories tell you “they” manufacture product x, but in reality, they simply buy it in locally from another factory. Many factories don’t manufacture their own raw materials, they simply buy in the raw materials. This is where quality control often falls flat when sourcing from a single factory (that the importer believes has full control of the quality from the source). Another challenge, we discovered, is that many factories grew up on American and European clients. The environments that the bamboo end products are usually installed in are VERY different to our local Southern African conditions. Think “double glazed” windows, air conditioners 24/7, etc. Those conditions are what defined the specifications most factories use in their manufacturing. We started importing products from China in the mid 1980’s, before the Internet based manufacturer directories. Over time, we have formed long standing and proven relationships. We visit all our factories regularly, know the owners personally. We don’t source from factories we have not investigated personally. We have worked together with them, jointly developing specific products, at times being a test bed for products (and eventually usually get copied by our competitors). Rolled up our sleeves, spent much time in the Chinese hinterland, shared meals in the homes of the people we work with. We discovered the stories behind the bamboo flooring and board industry, met and worked with the pioneers. Debated the pro’s and con’s of different glues and techniques, gained understanding in the little things that make BIG differences in the end products. A far cry from a rudimentary tour of a factory and a meal at the local fancy hotel while deals are struck based on superficial impressions, bold marketing and pricing. We call this “intimate knowledge”. The knowledge we use to specify exactly how we want our products manufactured for our specific Southern African environment. Drop us a line if you will be using more than 3 cubic meters of timber and we’ll gladly help you with your project. Certified ISO 14001 – Our factories consider their impact on the environment – they don’t spew toxins into rivers, etc. World class factories & manufacturing standards are upheld – you get top quality products. Why choose Oriental Bamboo over other Bamboo suppliers? Oriental Bamboo is a South African based company, specialising in wholesaling bamboo boards and doors to manufacturers. Our clients include architects, interior designers, interior architects, joiners, kitchen manufacturers, cabinetmakers, furniture and door manufacturers. As there is no official grading system for bamboo it’s difficult to know what one is buying. Bamboo products may look the same on the surface, but the companies providing them may not be. Why? What quality standards are applied? Eco-Logic Bamboo is manufactured in CE, ISO 9001, ISO 14001 (Environmental Management) certified factories. This ensures that the product you receive has been manufactured to strict internationally recognised quality control, environmental friendly production standards and that the raw materials are sourced in environment friendly managed forests. In addition our factories are registered with INBAR (International Network for Bamboo and Rattan), thus ensuring the Bamboo is harvested in a manner that supports both social upliftment of local communities and environmentally sensitive management of the Bamboo forests. The programs supported also include skills transfer, training and research. You can therefore be assured that our products do not originate from a “sweat shop” where child or unfair labour practices are employed to ensure the cheapest product. Being a member of the NFWA (National Wood Flooring Association) ensures the factory staff are up-to-date with technical developments and trends in wooden flooring. The NWFA is a non-profit trade association representing all segments of the hardwood flooring industry, from manufacturers, to distributors, to retailers, to installers. We provide training and resources for wood flooring professionals to assure that you get high-quality flooring that will last a lifetime. Our forests are FSC Pure certified. You are therefore guaranteed that our raw materials are really grown and harvested to international forestry control standards. We’re a member of the Environmental Goods & Services Forum, a Department of Trade & Industry initiative promoting the environmental goods sector in South Africa. When any wood is harvested, a period of curing is required. Often, in order to save costs, manufacturers process the bamboo before it has fully cured. This will ultimately lead to an inferior product. Eco-Logic Bamboo, when harvested, is placed in a continuous trolley drying room, heating all bamboo strips using hot winds until they have reached the required moisture content. This ensures that the strips dry correctly and at the same rate, thus ensuring uniformity. Not all manufacturers are consistent in ensuring the strips are dried to the correct moisture content for further processing. Short cuts in this step will result in poorly bonded boards & planks, that can de-laminate. 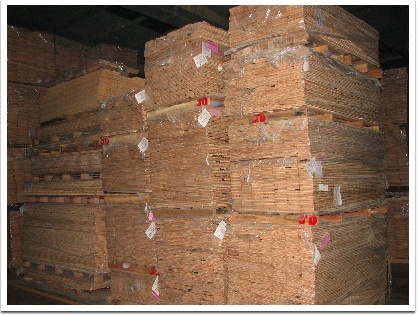 After processing, a stabilisation period is required to ensure that the bamboo strips have laminated well and that no de-lamination, bowing, bending or cupping will occur. This part of the process ensures the quality of the product shipped to clients. In order to reduce the manufacturing costs, and thus the price, many manufacturers skip the stabilisation process completely, resulting in an inferior quality product. Oriental Bamboo boards are placed in a constant 25º C / 55% humidity controlled stabilising rooms, for up to 15 days, after the lamination process is completed. There are two primary purposes for this extra step:– first, to control the moisture in the laminated Bamboo planks, and second, to release the pressure after the 1200 metric ton pressing process (minimal warping or de-lamination should therefore occur). 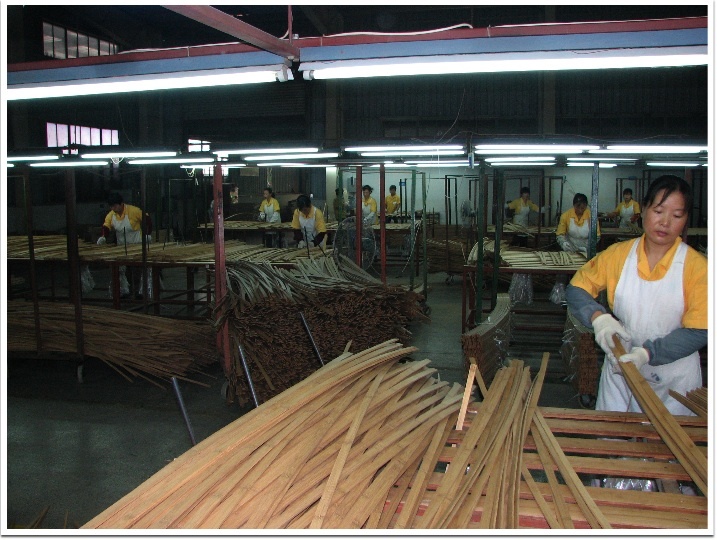 A moisture testing step is included in the quality control process employed by the manufacturers of Eco-Logic Bamboo. This extra step in the process ensures the adaptability of Eco-Logic Bamboo products in different climates. Consequently, Eco-Logic Bamboo meets the humidity requirements in Asia, North America, Western Europe and Russia. If the manufacturing time for the Bamboo product is less than 30 days, it is unlikely that this stabilisation step has been employed. Bamboo is a very structurally stable “wood” when being compared to other hard woods. The following bamboo stability chart shows how bamboo compares to other hard woods. Bamboo flooring can be as soft as Pine or harder than Maple. This all depends on when it is harvested and the species used. There are over 1500 species of bamboo. Younger, less mature bamboo, harvested before four years, is less expensive, softer and less stable. Flooring that is made from these immature poles is softer and may easily warp, cusp, dent or de-laminate. The bamboo used in Eco-Logic Bamboo products (Mao bamboo), is harvested at maturity to ensure the most stable and hard poles can be obtained. The hardness of wood is measured using a test called the Janka hardness test. The test involves pressing an iron ball into the bamboo plank and measuring the amount of pressure required to sink the ball halfway into the plank. Bamboo hardness charts comparing unfinished bamboo, finished bamboo to other hard woods is available for your reference. What kind of finish is used on the flooring board? Some companies buy flooring planks from suppliers that outsource various stages of the manufacturing. There is therefore no guarantee that the machining equipment is maintained to specifications. Or that the machining or finishing of the product is within specifications. 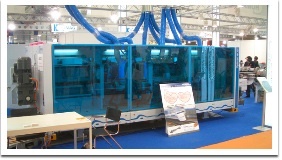 For example, the machine tolerances may vary from shipment to shipment, resulting in ill fitting boards or accessories. Also, there may be varying numbers of finishing coats applied (from 3 to 6 depending on the factory) and different or varying glue and finishing products used from factory to factory. A polyurethane-only finish may be used, which will not be as durable as a finish containing aluminum oxide hardener. The gap between the tongue and grooves of Eco-Logic Bamboo flooring is 0.15 – 0.20 mm. Eco-Logic Bamboo products conform to the European E1 standards and exceeds the strictest European formaldehyde and phenyl emission requirements (SGS rated “non-detectable”). Eco-Logic flooring is coated with 6 coats of a UV protecting / polyurethane finish from the European standard, Treffert & Klump Coatings, thus ensuring the highest quality coating. These coating products are water based and are free of halogenated hydrocarbons, heavy metals, herbicides, insecticides, pesticides or formaldehyde. Aluminium Oxide hardener coating is standard in all our flooring – this ensures a durable, scratch, burn & chemical resistant finish. What is the formaldehyde emission (VOC) level of the adhesive used to laminate the bamboo slats together? High formaldehyde levels would somewhat negate bamboo’s environmental advantages. Traditional plywood, chipboard, MDF and OSB boards are primarily manufactured using Urea Formaldehyde based binders. The danger in using these products indoors, is that the indoor air quality will be affected by the emission of formaldehyde, a known carcinogen (cancer causing). These emissions are commonly referred to as VOC’s (Volatile Organic Compounds). Higher emission formaldehyde adhesives are less expensive than those with lower levels, therefore some manufacturers use these cheaper products to save on costs. Ask your supplier to see their product specifications, to ensure that the finishing material is non-toxic and to review the product’s glue emissions. If the glues used are not formaldehyde-free / non-detectable, verify that the emission rate meets or exceeds the strict European E1 requirements of no more than 0.1 ppm. The glue used in Oriental Bamboo Eco-Logic products is of the highest quality. Oriental Bamboo Eco-Logic products exceed the European E1 standard for formaldehyde emissions, in that our bamboo boards, door and flooring planks are SGS certified with a ND (not detectable) formaldehyde emission. How thick is the flooring board? Some manufacturers supply a thicker flooring board. This is often due to the fact that the product is less stable at thinner tolerances. This is often caused by either harvesting the wood prematurely, not curing the Bamboo strips sufficiently or not stabilising the product after lamination. Therefore the manufacturer often specifies a thicker plank to compensate. On the other side, some manufacturers supply a 10-12 mm flooring plank (Strand Woven Bamboo) as less material is required and is therefore cheaper to produce. We initially supplied 10 & 12 mm planks, but after having to honour warranty claims with more expensive thicker planks, we performed an in-depth study into thickness requirements. The stability and strength of a flooring plank thinner than that of the industry standard 14 mm for Strand Woven bamboo and 15mm for solid bamboo is not suitable for Southern African conditions. This means that these planks are more likely to cup or distort and less likely to recover from exposure to excessive moisture. Oriental Bamboo Eco-Logic solid laminated flooring is 15 mm thick, whilst our Eco-Logic Strand Woven Bamboo flooring is 14 mm thick. When choosing your flooring, review the manufacturer’s warranties. Quality bamboo manufacturers will likely warranty their flooring for at least 10 years structurally. However, many manufacturers randomly pick a warranty period without performing the appropriate testing to ensure their product actually conforms to their stated warranty. Our factories perform extensive age and wear testing, and as a result, our Eco-Logic warranty is 25 years for defects in manufacturing, lamination, milling or assembly. The warranty for the finishing in a domestic application is 5 years and 2 years in a commercial application. Our outdoor decking planks have a 10 year warranty on the construction of the planks.